I must confess that once upon a time, I dreaded weddings with a lot of little people in attendance. And by "little people," I'm talking about wedding guests under the age of 10. Please don't misunderstand, I LOVE children and we have good time with them at weddings. Some of the most fun I've had over the years is playing with the flower girl when I have a few down moments at the wedding reception. We have some classic videos of the flower girls and ring bearers dancing for us that are absolutely delightful. With that said, I cannot help cringing when I hear we're going to have more than a handful of kids at a wedding, and I flat out want to scream when a couple tells me that there's no need to have any extra staff on hand for childcare because "their parents are going to be watching them." Okay, allow me to dispel the myth that all parents carefully supervise their children at wedding events - they do not. Instead of playing "man to man" defense - meaning each parent sticks with one or more assigned children, they play a "zone defense," meaning they figure that everybody at the wedding will be watching out for their children when the children are nearby them. That is just complete and utter ridiculousness. Reality Check: No other wedding guest wants to feel responsible for keeping your two year old out of the swimming pool, and my staff's job is to run your wedding, not keep the five year old from escaping to the beach without anyone to make sure they don't drown. This is serious business folks - I'm not joking here. Wedding venues can be dangerous places. There are candles, and tiki torches, and swimming pools, and sometimes open access to beaches and the ocean. If you're in a city venue, there will be busy streets outside. Children under 10 need to be monitored, and children under seven need actual direct supervision from an adult AT ALL TIMES. We had a wedding this January where the bride had a LOT of small siblings. They wreaked havoc through the villa all weekend, climbing on the furniture, even actually damaging a sculpture. The bride didn't want us to hire any babysitters because she said her family had it under control. They did not. In fact, at one point, one of the kids actually shook a burning tiki torch til he doused himself with fuel. Thank God he didn't catch fire, and we were able to clean him up fast so he didn't get chemical burns. But it wasn't his parents that saw it happen, stopped it, and rescued the kid - it was my husband. And he had already warned these little boys MULTIPLE TIMES not to touch, or even get near, those tiki torches. And then the parents of the child had the nerve to get mad at us for upsetting the little monster by speaking harshly to him. I'm not sorry that my husband, a retired cop and former firefighter too, spoke sternly to the child. I'm glad that all the other little kids who were part of the chaos heard him and were terrified too. Fire burns. It isn't something children should be playing with EVER. But when you take small children as guests to a wedding and you don't watch what they're doing, accidents happen. Yeah, it's annoying (and expensive) when they've colored on the linens or a wall. But being set on fire or drowning is a heck of a lot worse and both of those things can happen if you don't watch out for your children. And this doesn't just go for the actual wedding and reception. If there are beach parties, pool parties, and other pre-wedding events, these children need to be supervised at all of them. And no, it's not the job of the wedding planning staff to do it. 1. Hire a babysitter to be on hand at the wedding events that require it. No more than two little guests under five assigned per babysitter - they can't keep track of more than two of them moving fast with so many potential hazards at the venue. Years ago, we began offering brides and grooms with little guests the opportunity to have a babysitter on site at the venue to supervise the children and then settle them down with a movie in another room at the reception venue when they got tired and started to melt down. Nobody wants a child having a screaming fit during the toasts or any other important aspect of a wedding. It's distracting and miserable for everybody who didn't bring their own children with them. Also, most people are nervous about leaving their children at their own accommodations with a strange new babysitter and they're more comfortable knowing they can just go inside and check on them at any point. Generally speaking, this is a tab the bride and groom pick up unless the guests have specifically requested childcare. It's well worth every penny. 2. Do special welcome bags for your littlest guests. Include "quiet" entertainment for them - a bride of ours recently did a really fabulous job with this including card games, Lego kits, coloring books with WASHABLE crayons and markers, and sticker books. 3. Have a children's table at the reception if you have five or more kids attending. Instead of a centerpiece (don't need them playing with candles, do we? ), fill the center of the table with quiet entertainment. Again, Lego sets, small puzzle games, sticker books, funny mustaches and glasses, and other things like that will keep them quiet and entertained. Skip the coloring books and crayons since "washable" is a relative term when you're dealing with table linens you don't own. Since they're likely not having the same formal meal as the rest of the wedding party, ask the caterer to serve their dinners first, when they serve salads to the rest of the seated adults. Expect that they will be up and running around before dinner is over - another reason to have a babysitter or two on hand to supervise - but that's better than having them squirm and whine and aggravate everybody for an hour or more while dinner proceeds at a normal pace for the rest of the wedding. Some children really can't handle being stuck at the dinner table for a long period of time and the results can be hideous or hilarious, like the web-famous boy who pooped under a dinner table. 4. Plan some children's activities for them at the events - like bubbles (although make sure they play with these on a lawn or beach and not over tile floors where they'd turn it into a dangerous ice rink) or glow-light jump ropes. For daytime, outdoor activities, special floaties or kites or balls are all popular distractions. Remember that each small child needs an adult in the water with them at parties involving swimming. It only takes a minute for a little one to slip out of an inner tube - how long does it take for rum punch-soaked wedding guest to notice a child that isn't theirs is missing? I don't even want to think about it. Again, our staff isn't playing lifeguard and we're not responsible for watching the water. 5. Warn the parents of toddlers who won't be receiving a wedding meal that they need to come prepared with a cooler of snacks, juice boxes, bottles or whatever else the children require to get through the night peacefully. The caterers will not be prepared to feed those kids - they weren't on the list. Nobody is going to stop what they're doing with the wedding catering to take care of feeding somebody's toddlers unless arrangements were made by the bride and groom in advance. Snacks, pajamas, diapers, baby food, bottles, etc. should all brought by the parents of the child, and should be given - with instructions - to the babysitter on site upon arrival. By all means, invite all the small children you love to your wedding if you want to - they're hilarious to watch on the dance floor. 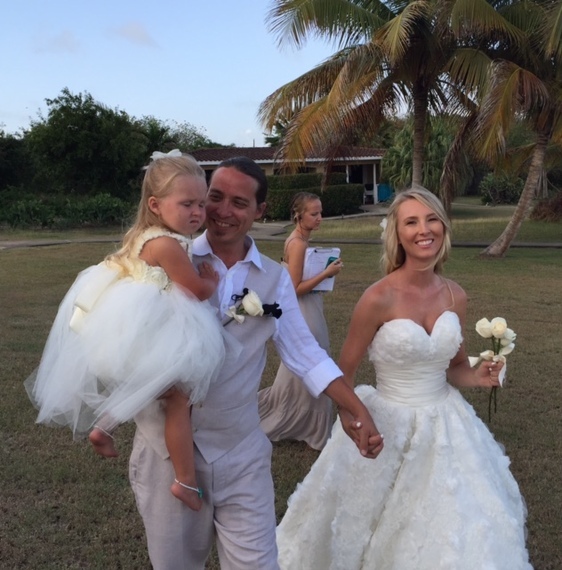 Last weekend's wedding with Lauren and Jonas Guentner and their three-year-old daughter Olivia went really well because bride Lauren put a lot of thought into what she would need to keep her seven little guests happy and entertained throughout the weekend, and especially at the wedding. And she requested an on-site sitter for Olivia and the ring bearer so that when the adorable littlest ones started to crash, they could be scooped up and taken to bed immediately. The result: Everybody had fun and nobody had to worry.